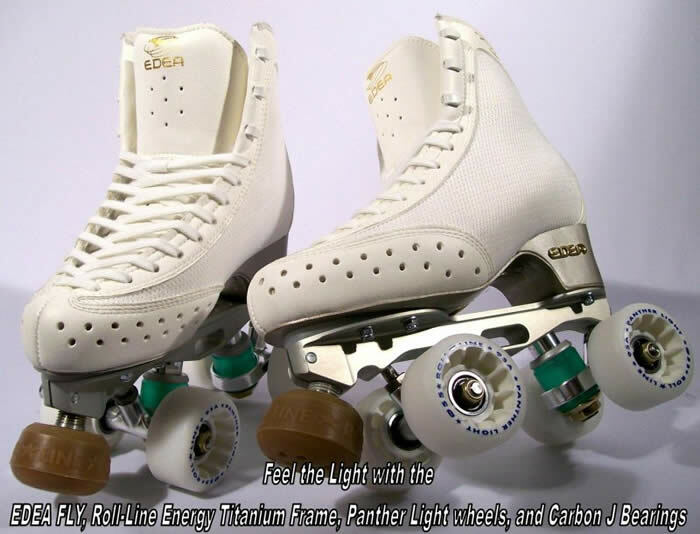 Fitting and Sizing EDEA Skates – Skates U.S. The boot for Skating is a technical tool, hence the fitting has to be very accurate. A correct size boot assures the comfort and enhances the Skating Performance. The non-correct size boot causes severe problems to your feet and can hamper your Skating efforts. EDEA Boot Sizes are in millimeters, in steps of 5 millimeters per size, for maximum accuracy. (5 millimeters is slightly less than 1/4″, 10 millimeters or 1 centimeter is slightly less than 1/2″). Your best option for finding your correct sizing, is to be assisted by the professionals at SkatesUS.com. Make a tracing of your feet (both Left and Right). First in a relaxed sitting position, then without moving the heels of the feet, stand and trace the feet again. Keep the pencil in a VERTICAL Position and snug around the feet. If these drawings are going to be faxed, be sure to accurately measure the distance from the longest point in the toes to the heel and then across the widest part of the ball of the feet (not straight across). When faxing, the images are scaled and will NOT provide accurate sizing information. Measurements can be made in inches, or better yet go ahead and use the other side of the ruler and make them directly in centimeters and millimeters. As a base indication, step into the boot (without lacing them up) and push your foot all the way to the toe, until you touch the tip of the toe of the boot. This will allow for checking how much room is left in the heel area of the boot. – For a growing foot, it is recommended to leave between 5 to 10 millimeters space. C. Usually it is recommended that one (1) full size or 10 millimeters be allowed for about one (1) years growth, for a growing youth. Sometimes growth spurts will out-grow this norm. – In a majority of people, if you are Right Handed, then your Right Foot is slightly larger, if you are Left Handed, then your Left Foot may be slightly larger. A Skating Boot that is too large will pull the ball of the foot into the arch area of the boot. This will cause continual pain to the feet and can lead to premature deformation which may cause damage to your foot support and will definitely affect your Skating ability and performance. 1. Another tell-tail way to tell if the Skating Boot is too large is to have the Skater (with the boots fully laced up) jump straight up and down on both feet. What we are looking for, is to evaluate whether the heel is staying locked into the Heel Pocket of the Skating Boot, or if it is raising up from the bottom of the Skating Boot. 2. Additionally, if the Skating Boot is too large, there will be loss of control and stability of the skate, as the Frame or Blade will (most normally) be sized for the Skating Boot (not necessarily the smaller foot inside). An oversized large Skating Boot, with the longest Frame or Blade that will fit on it, does a great dis-service to the Skater, as it may put the front Axle or Rocker of the Blade under the toes (possibly even under the tips of the toes), instead of the ball of the foot. Parents, Please do not go to an extreme, when purchasing Skating Boots for young GROWING Skaters. If the Skates are TOO LARGE, it will hurt the learning, performance, and even the pleasure of Skating. How Do I Know What Size Boot I Need and that it Will Fit? SkatesUS.com offers our Boot Sizing Trial Period as a very unusual service to it’s customers. This service will give you the confidence to purchase the best High End Boots and Skate Packages available. SkatesUS.com will send Un-mounted Skating Boots for Sizing purposes, upon request and payment and associated conditions. SkatesUS.com will charge the full price of the boots, per pair of boots sent for sizing, with a maximum of three (3) pairs sent at a time. SkatesUS.com gladly accepts the following credit/debit cards for payment of the boots: MasterCard, Visa, Discover, American Express. The Customer pays for the original Outbound Shipping and SkatesUS.com pays for the Inbound (Return) Shipping and for up to three (3) round trips, till you get the right size. SkatesUS.com will include a Return Shipping Label in the Box, all the Customer has to do is repackage the box and either drop off the package at the shipping location OR notify the correct carrier that the shipment is ready for pick-up (usually Fed Ex, just call 800-GO-FedEx). The Customer has 10 days from the date of the invoice to return the boots to SkatesUS.com. The Boots must be returned in “Like New Condition”, including each individual boot box. It is highly suggested that when trying on the boots, stay on a carpeted surface. If the Boots ARE NOT returned within the 10 day time period OR they are not in the “Like New Condition”, including each individual boot box. SkatesUS.com will assume that you are keeping the boots and that the transaction is complete. Any payments, will go towards the purchase of the boots. All boots returned in accordance with the 10 day period and in the “Like New Condition”, including each individual boot box, will be credited back to the credit/debit card after deducting for the purchase of the boots that are kept. NO cash refunds.